Pipe App. is a file transfer web application based on Adobe Flash with peer-to-peer functionality at its core, and most importantly there is no software to be installed on the user’s computers both the sender and the receiver because Pipe is a web application with the capability of running on Facebook’s app platform. Also because Pipe relies on Facebook for user authentication and matching, the user is certainly addressed which makes the transaction process safe and secure. To get the full functionality of Pipe you don’t need to install any extra software on your computer, and neither do your friends. Just open the Pipe app on Facebook and you have immediate access to all of your friends. The Pipe app creates a direct connection between you and an online friend. Files do not and won’t pass through Facebook as the file is transferred directly from your computer to your friend’s computer. 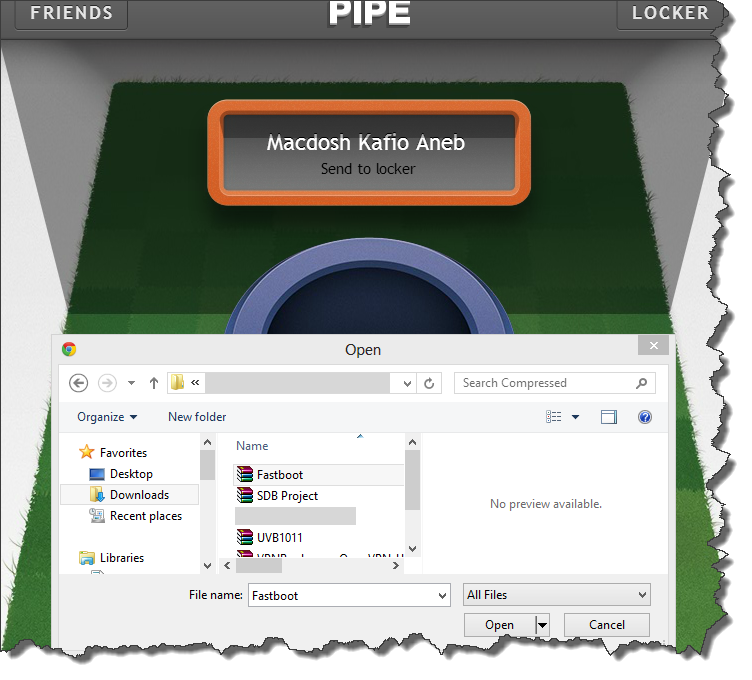 Green Pipe: it’s the kind of transmission you must use whenever your friend is online on the Pipe app, and it’s really simple and goes this way: if you drop the file in a green Pipe, your friend must be online on Pipe and ready to receive a file up to 1GB. Blue Pipe: briefly blue pipe is the transfer you made when your friend is online on Facebook, but not on Pipe App itself. Just send a file and drop it on the blue pipe and your friend will be notified by getting an invite from you. Grey Pipe: it’s the type of transaction you make when your friend is not completely available simply means when your friend is offline on both Pipe and Facebook, on that occasion still you can send a file to a locker for your friend to pick it up later. So from this point of view we know that we can always make a file transfer no matter whether our friends and colleagues are available or not. Pipe is a file transfer application that transfers files up to 1GB directly from one computer to another computer using peer-to-peer mechanism. To do this, Pipe uses the transfer protocol called RTMFP (Real Time Media Flow Protocol) from Adobe, which is based on UDP. RTMFP has a 128bit AES encryption for the communication channels between the sender and receiver’s computers which gives us the complete trust and on it. An in simple words this means files do not pass through Pipe or Facebook, as the file is transferred via a secure connection directly from your computer to your friend’s computer, or via a locker in other words, neither Pipe nor Facebook sees the files. In case where the intended recipient is either offline, busy or unavailable the user can choose for the file to be uploaded to Pipe’s cloud-based storage called ‘locker’ via an HTTPS encrypted connection. Each locker can contain a file up to 100MB. To establish the Pipe connection between friends whilst respecting the user’s privacy, Pipe uses only the anonymous 3rd party ID provided by Facebook. Pipe does not use real names or Facebook IDs for enabling the transfer of file. Pipe uses the very latest browser and Adobe Flash features and for this reason works best with Google Chrome and Comodo Dragon. Some Pipe features might not be supported by older browsers like IE6,8,9 I therefore recommend that users keep their browser up to date, and preferably use Google Chrome or Comodo Dragon. Even when users find themselves behind unusual network configurations or symmentic NAT’s, a file can still be transferred with pipe. In this case, the Pipe relay service forwards it between the two computers, but without ever storing the file. So it’s totally clear and understandable what Pipe App provides as a service is really reliable so go and get it. And believe me it has the potential to be a true game changer. If you are willing to visit Pipe App’s official website feel free to browse from >> here. And if you are really eager to jump to the App by clicking here >> Go to App. but before you do that make sure that you’ve logged in to your Facebook account.